No preheat, and you will still sweat double in half the time! Even better, the R-12 panels won't absorb your humidified sweat and stink like dirty cotton canvas. Simply wipe down the radiant panels when cleaning, without the shrinkage problem of cotton canvas tents. Additionally, the organic cotton webbing is so much safer than non-organic natural canvas that is GMO ready to release pesticides and herbicides into the air. Breathe Safe and go Organic! Near Infrared sauna therapy is more versatile than ever before with the Convertible Radiant Sauna Tent. This convenient design enhances the sauna experience by allowing the user to take a sauna session in the way they choose, while engaging in powerful near infrared light therapy. This tent is not only easy to assemble, but completely portable. In Lying Down Position: 198 cm long/deep; 90 cm wide; 120 cm tall/high. In Standing Position: 120 cm long/deep; 90 cm wide; 198 cm tall/high. In Sitting Position: drop-ceiling horizontal insert lowers the ceiling height from 198 cm down to a 152 cm ceiling height most ideal for "seated" near infrared light therapy. The convertibility of the tent allows the user to select from three options for their sauna session: standing, sitting, or lying down. The tent can easily convert from optimal height and length dimensions to your method of choice. Whichever way you choose, there is plenty of space inside the bright enclosure. Even two people can sauna together when lying down. The radiant panels of the tent are made out of nontoxic wood grain film, space blanket, large diameter bubble wrap, space blanket, and nontoxic film. This strong insulating material that retains 95% of the heat. They also come in an appealing wood grain pattern exterior. These panels are lightweight, flexible, and boast an R12 insulation value with an "A" fire safety rating. The panels are specifically designed to conserve energy, as they beam near infrared light around the tent enclosure. Radiant tent material differs from canvas and cotton covers as it is effectively able to retain 120 °F (48.9 °C) heat, and there is no preheat necessary. Fungus cannot grow in or outside of the tent, and there is also no outgassing of toxic vapors from the panels or enamel-coated frame. Even once heated, the radiant material remains nontoxic. The frame of the tent is stable, self-supporting, and takes no tools to put together. Learn how to assemble the tent. The steel poles are thoroughly powder coated in a non-toxic RoHS certified, zero VOC, white color. Purchase of the tent includes two natural bamboo floor mats. Only one is mat is necessary for the standing or seated sauna positions. For a lie-down sauna, you can easily hook the second mat onto the first for full floor coverage. The bamboo wood of the mats was boiled, and then baked under pressure with high heat. The mats are naturally fumigated* and feature radiant tent material backing underneath for additional sauna heat retention. Each mat is also fully secured with cotton canvas bound edges. Sauna Tent frame poles and brackets with a chocolate brown travel/storage bag. Radiant sauna tent panels and chocolate brown travel/storage bag. A drop-ceiling partition panel horizontal insert with a special slit to hang a near infrared sauna lamp (not included) for the sitting down position. Two bamboo floor mats* that fold up to fit easily in the tent panel travel bag. Full coverage insurance during shipping (via FedEx Ground) is provided when sent to USA addresses. 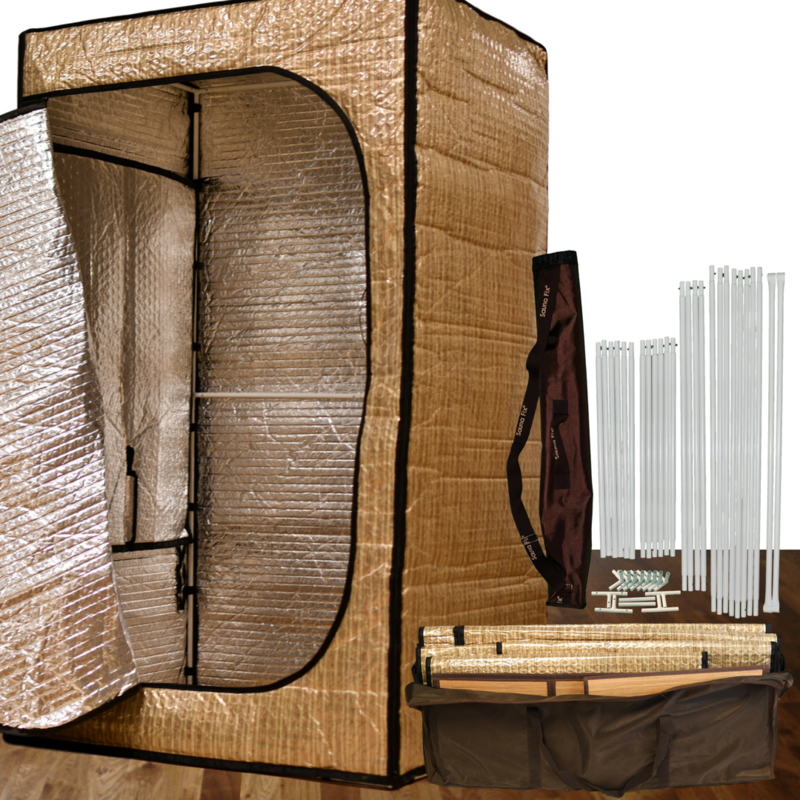 Near infrared sauna therapy is especially convenient with the Convertible Radiant Sauna Tent. Select your preferred way to sauna, and save time and money with the best sauna therapy possible. *Please be aware that, when heated, natural bamboo will give off a slight odor. It should dissipate after approximately a month of use. Although the majority of people have no issue with the natural odor, those who are chemically sensitive may wish to purchase an organic fleece throw rug or two to use instead of the bamboo mat(s). Be sure to also evenly distribute your weight over the mat(s) while taking a sauna, and avoid using any sauna stools with pointed feet that may cause damage to the mat. As of February 14, 2019, the Convertible radiant sauna tent holds a 3-year warranty. This warranty covers the workmanship, zippers, and sewing for normal use. It does not cover misuse of the tent panels and components, such as ripped zipper binding, bent tent poles or brackets, and tent fabric punctures. It does not cover scorched or melted panels caused by improper sauna lamp use, such as placing a sauna lamp in direct contact with the tent panels, or neglecting to turn off the sauna lamp when exiting the tent. Warranty does not include the cost of shipping to or from after 30 days. Any damages acquired during shipping must be reported as soon as possible, but in any event not later than specified in our policy. The customer must also save all the original packaging, provide pictures of the damage so a claim can be made with the shipping company, and sign a claim form. Failure to provide the required items and sign the necessary claim forms eliminates our obligation for damaged product replacement and results in a denial of the shipping insurance claim.